Saturday, I cycled into town. The market was busy despite the cold grey day. There was a smiling man in a tailcoat playing his violin with gusto. For a moment the sun came out and shone down on him, it was so cheerful, I stayed and watched him for a moment, and wondered about trying to draw him. Then I decided to do my errands first and sketch him later. Of course by the time I got back to the spot he had gone and the sun along with him! I know it was my fear of getting it wrong, [I don’t draw figures very often], that had stopped me having a go. 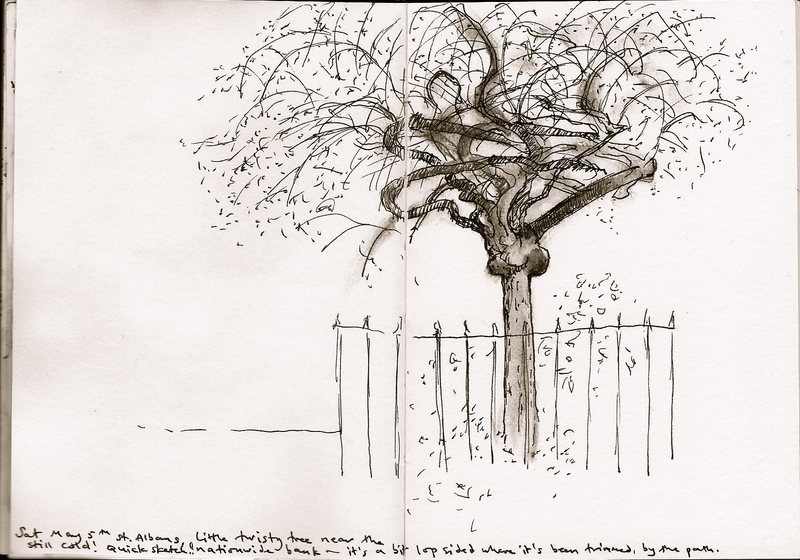 I went and found a little tree that I have often admired and made a quick sketch of that instead. I feel safe with trees, they just stand there quietly! I must get braver and sketch more freely, and try and capture those fleeting moments!